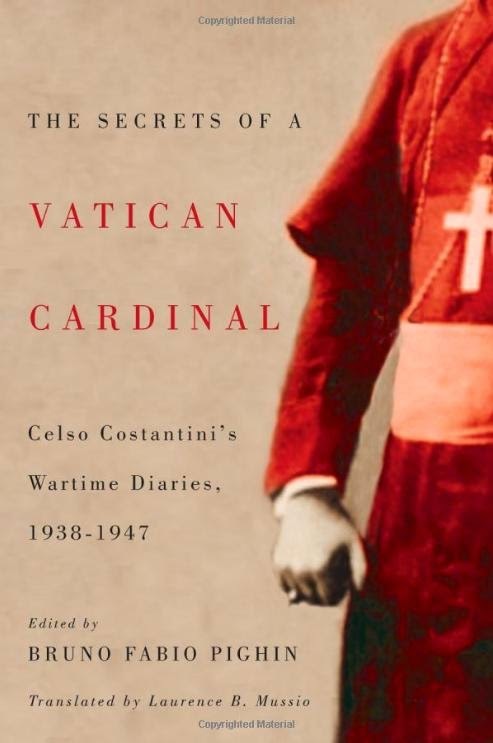 The subtitle of this book describes what the book is: Cardinal Celso Costantini's Wartime Diaries, 1938-1947. During the period in question, Costantini served at the Vatican as an Archbishop and secretary of the Congregation for the Propagation of the Faith. His office was in a Papal property in Piazza di Spagna. He was made a Cardinal in 1953. The book was originally published in Italian, edited by Monsignor Bruno Fabio Pighin. This English translation is by the historian Laurence B. Mussio, and I received it as a review-copy. In the historian-translator's preface, he states that the recognition of the historical value of the diaries by both the political left and the religious right in Italy convinced him the work was of value to historians. My purpose is to make a riveting document accessible to a wider readership of European and Church historians and scholars. 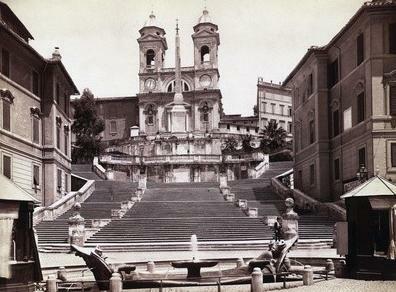 The Spanish Steps and Piazza di Spagna where the Cardinal had his Vatican office. ...insight and his deep knowledge of people, circumstances, and context, his diary is a considered, elegant, balanced, and firm-minded account. 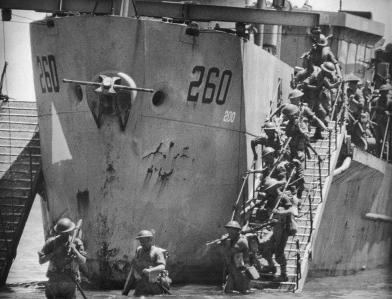 ...provide us with an extraordinary first-hand account of how the Second World War unfolded. 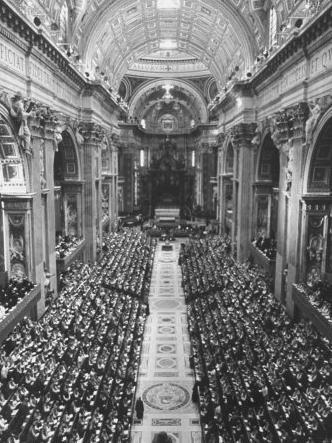 ...the prosecution of the war to the serial political, military, and strategic blunders of Mussolini, the decline and fall of the House of Savoy, and the actions of Pius XII in the face of Nazi tyranny. Also touched on are Italy's post-war politics, especially Italy's first post-war republican head of state, Alcide De Gasperi, who was protected within the Vatican during the Nazi occupation of Rome in 1944. I placed more emphasis on the enormous charitable work of the Holy Father [the controversial wartime Pope Pius XII] and his appeal for prayers. The diaries were published in their original Italian, as were other books based on the diaries and about Cardinal Costantini, all edited Monsignor Bruno Fabio Pighin, after the agreed amount of time had passed. Mons. Pighin, professor in the Faculty of Canon Law at St Pius X in Venice, Italy, is from the same Italian town as Cardinal Costantini, and has acted for many years as the Cardinal's biographer. Parts of the diaries that were published in other books edited by Mons. Pighin are not reproduced in this book; instead they are referenced and summarized. Many would have preferred Pope Pius XII to have shown a bit more discrimination. 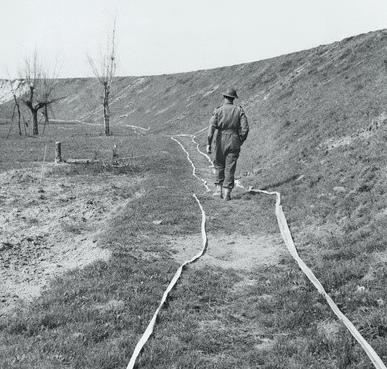 Post-war ratlines, routes devised by church officials from Vatican properties in Rome to Latin America, provided escape for perpetrators of crimes against humanity, subverting justice for their victims. 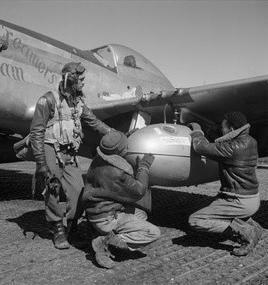 Many do not see charitable acts, pleas for prayers, or unrealistic conditions for a new world order as a proper, effective response to the horrors of very real mass-war, civilian massacres, and the Nazi's Final Solution. I count myself among the "many". 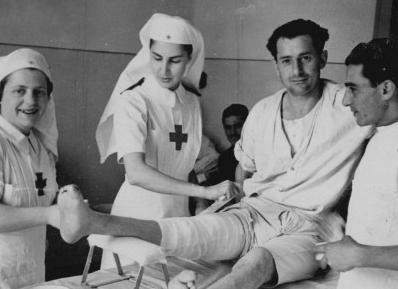 The Catholic Church is not the Red Cross, one of the other groups who performed countless acts of charity during the war. The Catholic Church, through the Pope, can speak directly to the consciences of millions of Catholics. 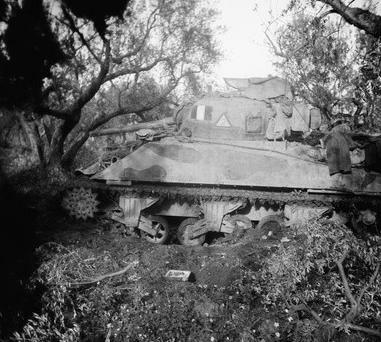 During WWII, there were many Catholics who needed to hear from the Church's spiritual leader that what they were doing, or not doing, was a mortal sin. The "prudence and extreme impartiality of the Holy Father", praised by the Cardinal, was an abdication of his moral responsibility to those baptized into the Catholic faith, in my opinion. I understand that the Cardinal and his biographer, both men of the cloth, needed to present this book in a certain way for publication. But now that the book is published, it is each individual readers' right to interpret the diaries as they see fit. That the diaries were published at all is an accomplishment, and I agree with the book's translator, that they are of historical value. The text of the book is meticulously edited, and it is accompanied by copious footnotes explaining people, places and events. The footnotes are a book in themselves! The notes are excellent and distracting at the same time, but there is no other alternative if the book is to be intelligible to all readers. The book is a whopping 500+ pages. 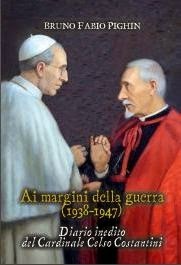 The original Italian version of the book by the Italian publishers, Marcianum Press, features a cover with an artist's rendering of Cardinal Costantini in an intimate conversation with Pope Pius XII. The work presents the grand figure of the Purple Friuliano [Cardinal Costantini], called "of an absolute superiority" by John XXIII, shines the light on his prophetic observations and gives evidence of his relationships with famous persons, among which are men of culture (D’Annunzio, Ojetti, Gemelli, Carnelutti, Maritain), politicians (Ciano, De Gasperi, Cini, Martino, La Pira), artists (Canonica, De Chirico, Mistruzzi, Messina), Cardinals and Popes (Sarto, Della Chiesa, Ratti, Pacelli, Roncalli, Montini). 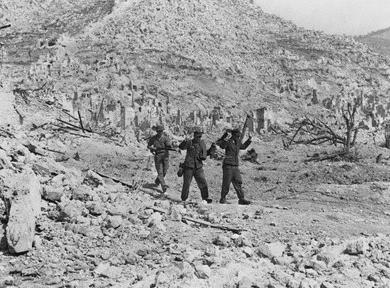 Two German Soldiers Captured in the Ruins of the Abbey of Monte Cassino, a target that should never have been hit, and which was subsequent to WWII rebuilt by the Catholic Church. I found the Cardinal's depictions of, and quotes from, historical persons the most interesting parts of the diaries, especially the idiotic statements made by Mussolini. Populist nonsense is more easily seen to be nonsense when it is presented in the black and white of print, and not shouted out to brain-numb supporters. But at a certain point, the Italian in the Cardinal overrules his neutrality, and his greatest fears are not for the Catholic church, but for his "homeland", Italy. All this is due to Hitler, who wants to replace religious with the myth of bloodline. Mussolini is Hitler's prisoner and is enveloped in the clouds of a poisonous flattery that isolate him from external reality. I admired the Cardinal's recognition of the role of a free press to avoid the growth of dictators and to combat the waging of wars of greed. And his linking of personal liberty to human dignity is lovely, even stating at one point, "Freedom is the condition for human dignity." Interesting, too, is his assertion that the armament industry's rapid technological advancements, combined with greedy, Empire-minded heads-of-states, led to the military campaigns waged around the world between WWI and WWII. What the Cardinal does not see is interesting, too. He retreats at times, with his Bishop brother, to their estate, where their tenant farmers work the land. The role of European aristocracy in the pressures for Empire-building, and in the growing grievances of the continent's poor are not mentioned. Communism and Fascism promised mass-education and a more equal society; they were the direct results of the European aristocracy's hegemony. The Cardinal's snobbery is clear in the diaries. Mussolini has never paid a visit to the new pope. The son of a blacksmith can sometimes be a gentleman; Mussolini is not. A Chinese proverb states, "You cannot turn yourself into either a tree or a gentleman." Rather than being a social or political theory, communism is often an explosion of the people's discontent and the desire to possess the riches of others and to avenge themselves against those currently privileged. 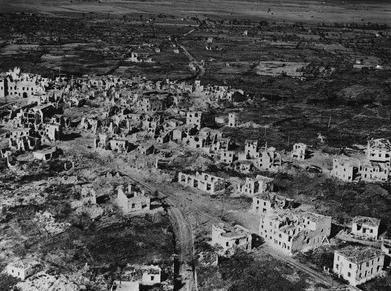 The Cardinal's love of Croatia, where he served during WWI, is evident in his diaries. He knows from his friends there, that the Fascist dictator Pavelic and his version of the Fascist black-shirts, Ustasha, were committing atrocities. And yet the Vatican helped Pavelic escape to Latin America, and let the Ustasha help run the Vatican's Ratline that helped other monsters escape justice. There is no mention of this, suggesting to me that the Cardinal has exercised great editing skills when writing his diaries, and when preparing his diaries for publication. To this day, the Vatican will not comment on the Ratlines. There are events that are missing from the diaries, such as the rescue of his dear friend Cini from Dachau by his son, Giorgio Cini. It seems odd that the Cardinal did not make some note of this, and other events. Perhaps he did, and they were edited out by Pighin or by the Cardinal himself, for some reason? I don't know the answer to that. There are also, especially in the post-war period, petty criticisms of Italian politicians from parties other than Catholic-affiliated Christian Democrats, who would, with help from the Vatican and U.S. agents, go on to dominate post-war Italian politics. The Monarchist Cardinal is saddened and bitter when Italy rejects the King in a national referendum. And the secularism of the post-war Italian state is seen as "a huge error of principle". His anti-Communist stance is visceral. 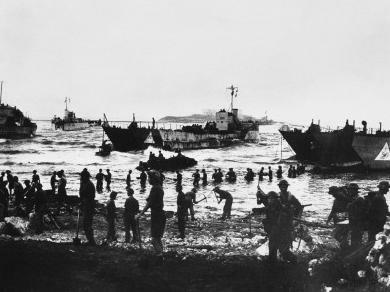 And his resentments and suspicious of the victorious Allies Britain and the United States are uncomfortable to read for their superior and condescending tone. He is also against any punishment of Fascists who "did not steal and did not commit any criminal acts". He equates the so-called post-war "purification" programs, which removed Fascists from positions of authority, to the persecution of Jews by the Fascists. Cardinal Costantini's passion in life was art. He was a talented sculptor. He worked his whole career to promote religious art, by writing scholarly articles, founding a magazine dedicated to Sacred Art, promoting the creation of religious art around the world, and by organizing art exhibits of that art. His other passion was spreading the Catholic faith to all parts of the world. He worked for the expansion of the Catholic Church through local "missions", run by local priests, bishops and eventually cardinals; with locally trained clergy; churches decorated by locally produced religious art; and church services performed in the local languages rather than in the clerical Latin used in the Western Churches at that time. Cardinal Costantini's most successful legacies are in those two areas: Sacred Art, and Catholic Missions. I suspect his diaries will become a third, more minor, legacy once scholars have had time to digest the content and to view it in the proper contexts. 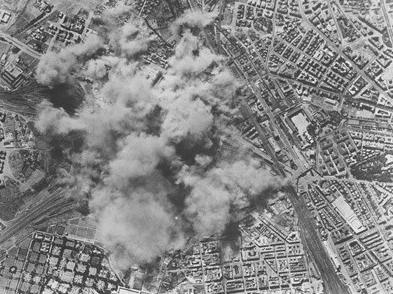 On 19 April 1940 Celso Costantini prophetically wrote in his diary that if Italy followed Hitler into war, it would be allying itself with the "Anti-Christ." 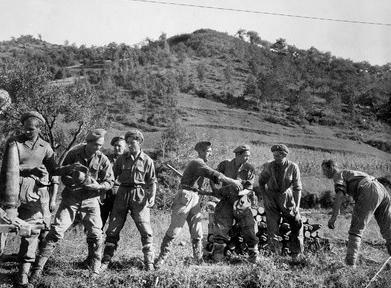 Within weeks, Mussolini's fascist regime plunged Italy into the destructive maelstrom of global military conflict. The ensuing years brought world war, the fall of fascism, occupation, liberation, and the emergence of a new political order. The Secrets of a Vatican Cardinal is an extraordinary and detailed behind-the-scenes account of crucial episodes in Europe's wartime history from a unique vantage point: the Vatican and the Eternal City. 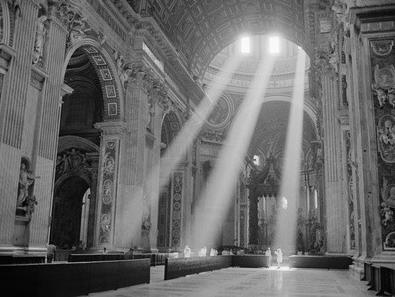 Costantini, a close advisor to Pope Pius XII, possessed a perspective few of his contemporaries could match. His diaries offer new insights into the great issues of the time - the Nazi occupation, the fall of Mussolini, the tumultuous end of the Italian monarchy, the birth of republican democracy in Italy, and the emergence of a new international order - while also recounting heartbreaking stories of the suffering, perseverance, and heroism of ordinary people. Less than a century later, with the world's attention gripped by the first papal resignation in six hundred years, The Secrets of a Vatican Cardinal presents a clear-eyed, fascinating, and complex portrait of the Roman Catholic Church's recent history. The Secrets of a Vatican Cardinal is published by McGill-Queens University Press. McGill-Queens University Press. McGill-Queen's University Press is a scholarly publisher that defends, refutes, and creates fresh interpretations of the world. With over 2,500 books in print and numerous awards and bestsellers, our goal is to produce peer-reviewed, rigorously edited, beautifully produced, intelligent, interesting books. This is the link to the English version of the website for the Amici (Friends) of Cardinale Celso Costantini.